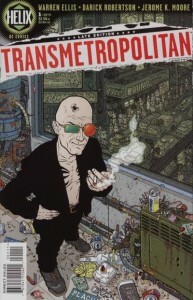 Transmetropolitan is a comic series written by Warren Ellis that ran sixty issues from 1997 to 2002. I own the complete run but had never finished reading it, I’d stopped at issue 45. No idea why really except that I’m easily distracted, and yes that means I have twelve year old comics in my reading backlog. Anyway, given my habit of acquiring stuff, it’s ironic that I found I was missing issue 58 when I was putting my comic list together for my resolution project. I’ve no idea if I just never bought it and maybe I misplaced it. Nevertheless, I can’t have a one issue hole in the series, so I headed off to Ebay to see if I could find a copy. Surprisingly I found three copies, all of them for under $5 plus shipping. More irony that my resolution to consume more and buy less turned into an excuse to buy something. It took me a few days of leaving the stack of comics on my deck before I finally picked the series back up, but once I did I was immediately hooked again and read through all fifteen issues in two nights. Even after all this time the conflict and characters came back to me quickly. If you haven’t read it I recommend picking up the trade paperbacks, its themes of government corruption and the duties of journalism are even more applicable now than they were twelve years ago. If you’re a fan of epic fantasy, humor, and well proportioned women, then you owe it to yourself to read Nate Piekos’ Realm of Atland. The current story arc starts at number 269 and is the best place to start for a new reader who wants to catch up quickly, but I’d say start at number 1. Nate updates every other week right now, so it won’t take someone too long to catch up, and you’ll avoid spoiling the plot when you get hooked and want to read from the begining. This is one of a handful of webcomics that I’ve actually purchased the books for, and that’s as high a recommendation as I can give it.